Santa Clara, CA--The California Golden Bears (5-2) played their most complete game of the season in routing Santa Clara 79-41. Cal opened with a 16-0 run and never allowed the Broncos a chance. Kristine Anigwe had 17 points in only 21 minutes, resting the entire fourth quarter in the blowout. Jaelyn Brown scored 11 off the bench, including three treys as the Bears hit 10 from distance for the game. The Bears got contributions from every available player, particularly on defense, as Cal held the Broncos to 32% shooting and forced 22 turnovers. Santa Clara (2-5) was led by Ashlyn Herlihy's 10 points. No one else scored more than seven. On offense, the Bears assisted on 25 of 29 made baskets; Asha Thomas led the way with eight. Cal attempted threes on its first four possessions, with the Bears hitting their first three. Kianna Smith hit two to open the game, and Mikayla Cowling followed with another. Having established their outside shot, the Bears went inside, and Kristine Anigwe scored twice in the paint. On the other end, the Bears shut down the Broncos, forcing Santa into multiple turnovers—travel, shot clock violation, and a 10-sec backcourt infraction. Two free throws from Anigwe, and one from CJ West, brought Cal the 16-0 lead. Santa Clara finally got on the board on a layup by Braggs, with 3:30 to go. Cal came right back with a three-point play from Alaysia Styles, and threes by Asha Thomas and Smith gave Cal the 20-point lead, 26-6. Two Bronco free throws closed the first period, with Cal ahead 26-8. 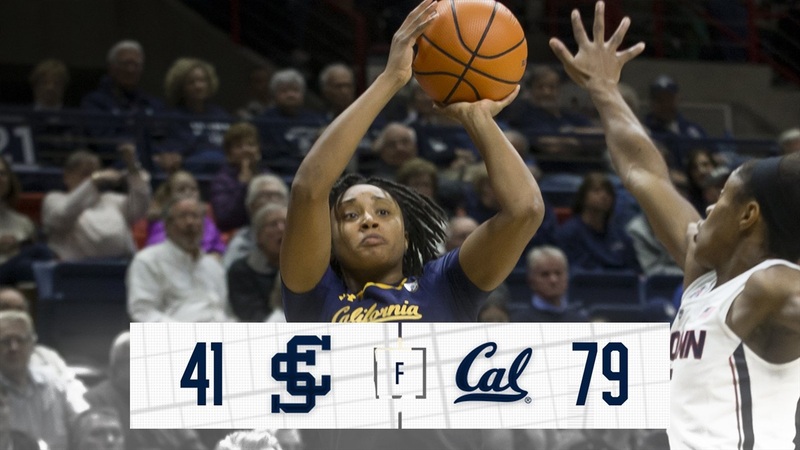 Cal turned the ball over twice to open the second, but before Santa Clara could gain traction, Anigwe attacked, showing off the new variety in her game. The junior knocked down two mid-range jumpers, then after receiving the ball on the low block, found a cutting West, who earned a trip to the line, hitting one. Sara Anastasieska sank a three, and the Bears were up 34-14, with 3:52 left. The Bears had an assist on their first 13 baskets. Mikayla Cowling’s steal and breakaway basket finally broke the string of 15 consecutive dimes, but the Bears continued to pad their lead. Jaelyn Brown knocked down consecutive threes, and the Bears were ahead 56-23, with 3:30 left in the third. “I definitely have learned the offense and know to get open for three,” said Brown. “I really challenged them at the beginning of the third quarter, because that’s been a problem for us,” said Gottlieb. Cal closed the third on an 8-0 run. After an Anigwe free-throw, Anastasieska rattled in a three. Then Smith found Anigwe running ahead, and the post caught the ball with one hand and in one motion tossed the ball in off the glass. Mo Mosley grabbed an offensive board and scored on a reverse. Cal entered the fourth up 64-27, allowing the Bears to bring in little-used Chen Yue. The junior post was quick on her feet on help defense, allowing her to get into position for a couple blocks, earning roars from the Cal bench and Bear fans in attendance. The Bears continued to dominate in the paint. Alaysia Styles hit a smooth baby hook, and CJ West picked up where she left off the last game, beating everyone down the floor for a score, bringing Cal to 73-33, with more than four minutes left. The Bears finished the game with nearly everyone getting in the scoring column, with only frosh Archer Olson failing to score. But the game will be remembered for Cal’s defense. The Bears set a bushel of season lows, including points allowed, field goals allowed (13) and three-pointers allowed (1).